Profiles are used to give a unique user experience to different segments of the network. Profiles can have different logos or allow for different methods of authentication. Each UXC can be assigned to one profile. Open the Profiles page to view a list of all the profiles. New profiles can be added by clicking the New Profile button on the top right of the page, or an existing profile can be modified by clicking on the profile name. Splash Page: This page is displayed to users after they enter their login credential or are otherwise activated by the system. Company Name: The company name will be used in some locations, such as the Terms and Conditions. Enabled: Be sure to enable the profile to allow it to be assigned to a UXC. Allow Device Authentication: If this option is turned on then devices can be authenticated by their MAC address and don’t need to enter a username and password. Registration Required: Enabling this option will require users to enter in their basic biographical information to create an account. A password will be created and tied to their email address to access the network. Disabling this option will automatically register new users on the system. Show Welcome Screen: Enable this option to force users to see the welcome screen that contains the logo and possibly the terms and conditions. If this option is disabled then devices that the system recognizes will be allowed straight to the Internet. Show Terms on Welcome Screen: This option controls whether or not the terms and conditions will be displayed directly on the login page to users that are automatically registered. There are options to display to these users the first time, every time, or never. Global Network Password: If a global network password is set then users that do not have to register will need to enter in a profile specific password to gain access to the Internet. This page controls the access plans that will be available for the profile. If an access plan is set to be available everywhere then the access plan will be available on this profile even if it is not checked. If there is only one free access plan available for this profile then that plan will be automatically selected for users. 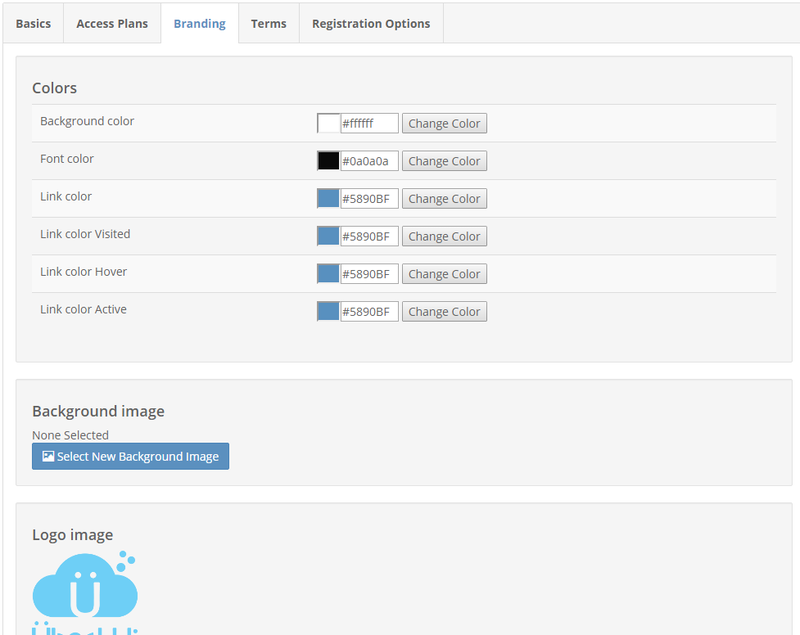 The branding tab allows for various settings on the login page to be customized. 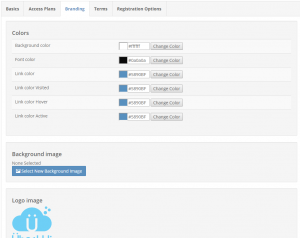 Click on the appropriate buttons to change link text colors, choose a background image, or upload a logo. 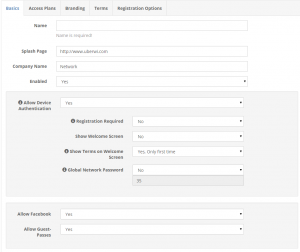 The tab allows you to customize the terms and conditions that will be displayed on either the registration page or the initial login page depending on the other profile settings.